The Hobart Mercury has brought readers up to date on the latest advances in Aboriginality. AN indigenous healer is singing to the spirits on Mt Wellington, native berries are being shared as bush tucker and a 40,000-year-old ­connection to country is guiding the hands cultivating the soil. These are the traditions of the oldest continuous culture on the planet — and the same indigenous practices are part of present-day Tasmanian Aboriginal entrepreneurship. Sheldon Thomas, director of Trowunna Tours, has been studying traditional healing practices through an indigenous Alice Springs teacher. 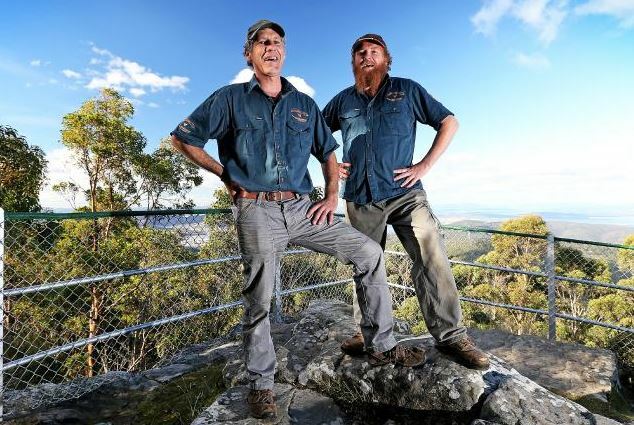 He infuses the ancient wisdom into his tours on kunanyi (Mt Wellington), where participants are encouraged to let their spirits connect with the land. Almost 100 people have been taken on a Trowunna tour since they began operating last year, with visitors ­experiencing bush remedies, bush tucker and stories. One of the highlights is Mr Sheldon’s soaring song at the mountain’s “Octopus Tree”, which has tentacle-like roots wrapped around a giant boulder. “It’s a healing place for all people,” he said. In June, Mr Sheldon will host 60 interstate visitors at Cradle Mountain, where he will deliver a healing program. Meanwhile, he is also selling little jars of healing — called Rrala Rub — that come straight from the bush, using extracts from leaves for aches and pains. “You see Aboriginal people at their strongest when you see them mutton-birding,” Mr [Clyde] Mansell said. Aboriginals like the two gentlemen below, for instance, as presented to Mercury readers. Are you sure the tours weren’t cancelled in Dec and Feb due to the snow falling on Tasmanian mountains at the time. What are they going to do during the snows next winter. Don’t tell the greens they believe Tasmania is undergoing global warming and are focused on the one bush fire in that occurred in 1.2% of a heritage listed forest. They were dogged in their denial of the snow during the summer. Tasmania the land of kookyness and deniers. The next project for the Tasmanian Aboriginal Land Council could be a remedy to combat alcohol and drug abuse, family and community violence, sexual abuse of women, particularly of female children in remote indigenous communities in mainland Australia. Perhaps a specially prepared, bush-derived concoction, taken orally and reinforced with “a 40,000-year-old ­connection to country”, further boosted by “soaring song at the mountain’s Octopus Tree”, will remedy the problem. Yes, the above is caustic sarcasm, while referring to Aboriginal culture as the “oldest continuous culture on the planet” is bizarre irony. Culture? …Yes, the above is caustic sarcasm, while referring to Aboriginal culture as the “oldest continuous culture on the planet” is bizarre irony. Culture? Bill, your sarcasm and eye for ‘irony’ would be helluva lot more credible if it was not directed against the descendants of people who were actually subjected to official and unofficial campaigns of genocide: to the point where there are no ‘full-bloods’ left in Tasmania or on the mainland below about the Tropic of Capricorn, and in cultural and linguistic sense, the Tasmanian Aborigines have been totally exterminated; thereby adding an extra drop or two (hundred) of venom to the headline of this lamentable piece: Get Your Indigenous Healing Crème. My apologies for offending your sensibilities Ian. I can’t help the feeling that exalting Aboriginal culture and rhapsodising about it is rather ridiculous. Besides surviving at a stone age standard for 40-odd thousand years, what did Aboriginal culture contribute to the advancement and well-being of humanity? Oh, of course, dreamtime stories and connecting with country. Awesome! Good for them, if they can part fools from their money and take a bit of care for themselves then more power to their arm. So I take it that in your view my reference to the reality of past genocide: ie the deliberate mass murder of men, but also of women and children is “exalting Aboriginal culture.” Well, I suppose it is an exaltation of the abilities of these peoples to survive. The oldest direct evidence of Aboriginal presence on the Australian mainland is at around 40,000 years BP. But there is indirect evidence that a founding population arrived at around 110,000 years BP. They had tools and implements of wood and stone, and were completely lacking in metallurgy and ceramics: which were yet to develop on the Eurasian landmass and in the regions of Africa to be eventually linked to it by trade routes. But if you think that all they had was “dreamtime stories and connecting with country” you might try this simple experiment. Have yourself dropped off stark naked on the roadside somewhere back of Bourke, with no matches or containers of water, and only your wits, knowledge of lore and “connection with country” to survive by. See how you go. And good luck. Ian, with all due respect, your arguments in defence of Aboriginal culture are spurious and rather hollow. The simple fact is that while other races in various parts of the world reached stupendous heights in multiple fields of the arts, in the sciences, in engineering, in architecture – the list is practically endless – the Aborigines achieved precious little beside primitive survival in the meantime. No amount of sentimental “respect” can alter these facts. Cultures arise, develop and decline according to their usefulness to contemporary society. The only remaining value of Aboriginal culture is one of sentimentality and as an interesting subject for anthropologists. …the Aborigines achieved precious little beside primitive survival in the meantime. Are you saying that if only they had got it together and been a bit more savvy and industrious, they too could have developed the same sort of art, architecture, science, engineering etc etc: in the isolation they were in on this continent? Sorry, and with all due respect, but human history does not work that way. What they did show is how adaptive and creative, culturally and technically, members of our species can be: even if established as an isolated and small founding population on this, the second-driest continent on Earth. (The only one getting less annual precipitation of H2O being Antarctica.) ? I recall for some reason what someone once said about Albert Einstein: If he had been born in the Neolithic, before he died, he would have been flat out & have done well to have come up with the idea of the wheel. I am happy to agree to differ Ian and to leave it at that.